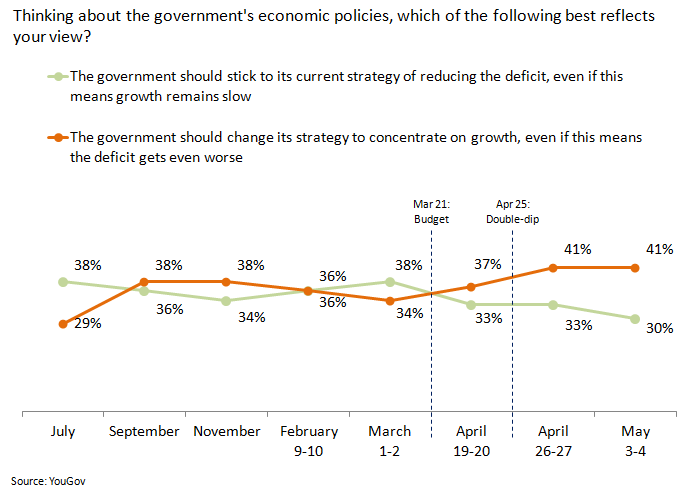 I’ve been following for a while a YouGov question on the central issue of how we deal with the crisis: should the government focus more on growth or on reducing the deficit? When I last wrote about it the public were quite evenly split, following a shift towards more people wanting attention on growth. Since then, the government’s emphasis on reducing the deficit regained support in the first quarter of this year. Perhaps this was helped by Labour’s announcement in January that they wouldn’t necessarily reverse the cuts – though I doubt this did too much to public opinion, and suspect the changing mood was more down to a relative lack of bad news on the economy and the government seeming fairly stable. But since the budget and double-dip, the mood has shifted. The proportion wanting more attention on growth, even if the deficit gets worse, is now 11pts greater than the numbers who want to focus on reducing the deficit. Regardless of the economic validity of focusing more on growth than the deficit, the public have become more receptive to a different economic approach. But Keynesians should still be cautious: fewer than half support their approach, and even the return to recession didn’t make a huge difference to opinion. The ground may be becoming more favourable but it is still far from secure for an Hollande-style refutation of austerity. This entry was posted on Monday, May 7th, 2012 at 13:10	and is filed under Politics, Solutions. You can follow any responses to this entry through the RSS 2.0 feed. Both comments and pings are currently closed.